The Local in Boone starts the party early on summer nights. Students sip cold pints on the outdoor deck, while in the dining room, families gather around hulking wood-fired pizzas. Behind the bar, co-owner Alaina Walker shakes and stirs a bevy of summer cocktails. 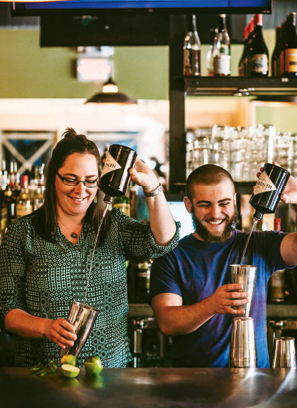 A nine-year veteran of mixology, Walker loves exploring new flavors. “I love getting to know the botanical and herbal liqueurs and how they add just the right nuance to a cocktail to make the libation pop,” she says. The Local’s drink menu features highlights like the cheek-puckering Chipotle Margarita, with house-made chipotle simple syrup; the bittersweet Ruby Red Salty Dog, with grapefruit juice and the French vodka and fruit-based X-rated Fusion Liqueur; and the complex Lavender Word, with green chartreuse, gin, lemon juice, and lavender syrup and bitters. And, for hot summer days, Walker loves a gimlet—restyled. Hers, a cucumber-basil concoction reinvented with garden-fresh summer produce, has just the slightest hint of sweetness. Enjoy this one at home, up or on the rocks. Chill a martini glass with ice and water. Add basil, cucumber, and sugar to a cocktail shaker and muddle. Add ice then gin to the shaker, squeeze in lime, and shake vigorously. Discard ice and water from martini glass and strain gimlet into the glass. Garnish with cucumber ribbon.